Section drawings are a very important part of designing a building. They give us a more complete idea of what a building might look like when it is built. What do sections look like? A section looks like a building sliced in half, from top to bottom, to reveal the interior. These drawings allow us to look directly into the halved building and see the features inside. Gather a few objects in your home that would be fun to draw. Picture what each object would look like if it were cut in half, and draw what you’re imagining. If you’re using food, like a fruit or vegetable, have an adult slice the object in half to help with your drawing. Look at your drawings. What did you learn about your object that you didn’t know before? Follow the instructions on the sheet to submit your child’s creation. 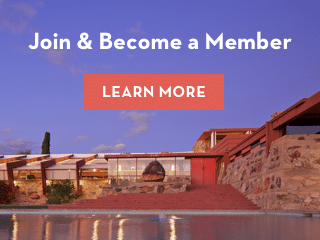 We will print a limited number of submissions in a future issue of the Frank Lloyd Wright Quarterly magazine and share some on our blog and social media. Check out FLW150.com to learn more about the celebration, new products, and find events near you!